Anyone with food restrictions of any kind can tell you: holiday eating can be rough. It can be difficult navigating holiday fare that doesn’t necessarily cater to those with food restrictions, especially if there’s more than one or they’re newly in place. Likewise, if you are hosting a guest who these restrictions, it can bring panic to the menu planning. Thankfully, there are lots of resources out there to help figure out how to make everyone happy. One such is Vegan for the Holidays: Celebrations Feasts for Thanksgiving through New Year’s Day by Zel Allen. I’ve used this cookbook for a number of years to make a particular soup I love that involves squash, pears, and cranberries, but I’ve never brought it to a holiday meal as my family doesn’t typically do soups for holidays (and it’s messy to transport). In the run-up to Thanksgiving, I wanted to try out some other recipes from Vegan for the Holidays to see what would work for the upcoming holiday season, whether with friends or family. The book is divided into Thanksgiving, Christmas, Hanukkah, Kwanzaa, and New Year’s, and each section has recipes for the main dish, sides, desserts, and drinks. Some of them are pretty quick and simple to make, while others are much more involved and time consuming. Ingredient lists follow my descriptions of the process. Unsurprisingly, the mashed potatoes and gravy were the easiest, least time-consuming part of the three dishes. They turned out really light and fluffy—it was the first time I’d not used dairy or a dairy alternative, just the water the potatoes were cooked in, and it surprised me how fluffy they were (in a really good way). Besides the water and the potatoes, there were onions, garlic, salt, and pepper to be all cooked together for about 10 minutes until the potatoes softened. The recipe calls for water and yeast flakes to be used during mashing, but we didn’t use the flakes and it still turned out tasty. The gravy, also, was very light, flavorful, and a great complement to the potatoes. It consists of chardonnay, water, salt and pepper, corn starch, onion, a carrot, garlic, tamari, plus marjoram, tarragon, and cinnamon. My fiancé and I chose Dreyer-Sonoma chardonnay to use for the recipe and we loved it, but I think any chardonnay that suits your tastes would do. It definitely took more steps to make this as compared to the potatoes, including a blender or an immersion blender to be used after the veggies are softened. It makes it a very light gravy—quite different from the gravy I grew up with, which was dark, heavy, and salty (but still delicious). The first batch of recipes. In the big blue bowl in the middle is the Wild Rice Pilaf, topped with green onions. I’d say it was fairly easy to make as well, just with slightly more ingredients than the potatoes and gravy. It’s full of veggies and deliciousness and would work perfectly as a gluten-free and vegan alternative to stuffing. It takes two pots: one for cooking the wild rice and one for cooking the onion, tomatoes, and spices, plus an addition of chestnuts or walnuts, green onions, and parsley for garnish. It’s a very balanced dish that I would definitely recommend as either a side or a main dish at any event, though a little butternut squash would not be remiss. 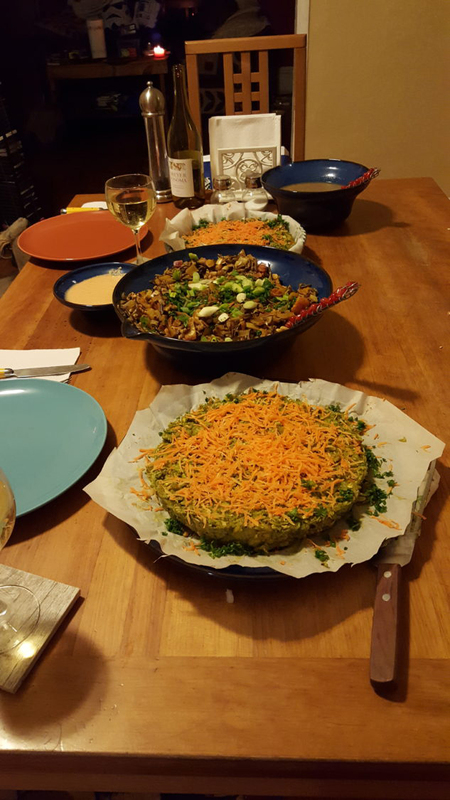 Flanking the pilaf is the Pistachio Torte. This recipe called for a springform pan, which I don’t own, so I used a regular flan pan, and it created two tortes. The only thing that had to be changed was the baking time. Clearly, this is not a recipe for those with tree-nut allergies, since it has both pistachios in the torte and cashews in the aioli. There are oats as well, though I’ve been lucky to find oats in a gluten-free-dedicated facility. It’s interesting to me that the recipe included quite the list of spices it did—ginger, cumin, coriander, poultry seasoning, fennel, oregano, marjoram, turmeric, cayenne, and pepper—though this is the first torte I’ve made, so I’m not sure if it would be normal or usual. The only ingredient I needed to take out was the red bell pepper, though I don’t find that to be a common allergy or sensitivity. This is a really involved recipe that uses a rice cooker for (obviously) the rice, a bowl to keep the oats, ground pistachios, baking powder and baking soda, and salt, a pot to cook the veggies in, a blender for cashews and water, and another small bowl for the vinegar and the cashew-and-water blend. At the end, everything goes in together to be mixed and into the pan you’re using. The aioli is quick and easy, with roasted tomatoes blended with water, cashews, garlic, lemon juice, salt, and paprika. It’s creamy even without the typical aioli ingredients of egg and oil. The amount of flavors in this recipe even without the peppers was astounding, and I really enjoyed the warmth of the torte with the coolness of the aioli. It would be a delight to anyone looking for a refreshing dish to dazzle those who don’t believe that vegan and gluten-free food can be delicious. Of course, Chris and I had to use the chardonnay from the gravy as our drinks for the night to really round out the meal. We also included cranberry sauce. It’s a great meal on its own without a need for anything additional—both of us were totally stuffed. The second bath of noms. The hardest part of this meal was the Brazil Nut Cabbage Rolls with Sweet and Sour Sauce. It calls for vegan sausage or seitan, but you can pick another filler if, like me, you hate vegan sausage and can’t eat seitan. It also includes cabbage rice, onions, bell pepper, garlic, Brazil nuts, raisins, and pepper. This by itself took three pans, plus the one to cook the cabbage and another to make the sauce, which is basically just sugar and tomato paste with lemon juice. Chris was in charge of this creation, and it took at least an hour to prep the veggies and cook. It required lots of pans, stovetop cooking, and oven baking. Even so—totally worth it! Even just two of them and maybe a small side would be enough for a light lunch. The blend of savory and sweet is really nice in this recipe. We didn’t include the bell pepper, and I didn’t feel like it was missing anything, but if you like it, totally keep it in! I personally didn’t like the Brazil nuts in this, but that’s just from the crunch of it. The parsley made a great garnish. The nut stew was ridiculously easy to make and incredibly delicious. With cabbage, several root veggies, tomatoes, raisins, and peanut butter, it is a wonderful stew. Both this dish and the cabbage rolls do include nuts and peanuts, which may be a concern for some of you or your loved ones. I used cabbage left over from the rolls for this recipe, which makes it easy to pair them together. I’d classify it more as a chili than a stew even without it asking for chili powder or peppers; rice has always been a staple for chilis I eat, so it was really nice to see this called for rice as part of the recipe. The next time I make it, I’d probably add a little more peanut butter to it, but that’s just because of how much I love it. Barely shown are the Maple-Baked Sweet Potatoes. The thinly sliced sweet potatoes are drenched in a sweet sauce of maple syrup, lemon juice, salt, raisins, and dried cranberries, then baked for an hour and garnished with parsley (again) and fresh cranberries. They’re definitely better as a dessert than as a side, but we ate them as a side anyway. I’d recommend using multiple baking sheets for these; otherwise, you’ll run into some that are really soft and some that are still a bit crunchy and undercooked. A closer shot of the meal as it stands in the dish. This meal is incredibly filling, more savory than sweet—at least until you add the cranberry sauce and the sweet potatoes. Rounding it out is the Pumpkin Apple Nog, to be made with your nondairy milk alternative of choice. It is much less heavy than regular egg nog and is quite tasty with a splash or three of Kraken spiced rum. 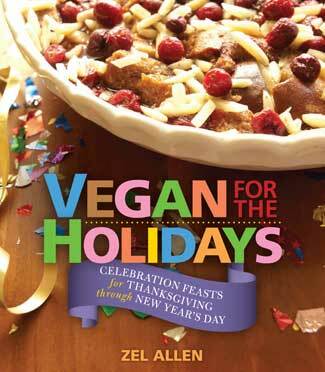 Vegan for the Holidays by Zel Allen is available in paperback and ebook. All in all, this was a great experiment. Thankfully, this cookbook—which I highly recommend, whether you’re vegan or not—is a mix of simple and difficult meals. It’s great for both on-the-go meals and stretching one’s culinary skills and patience. Everything I’ve tried in here has turned out very well. It’s easy to read and cleanly laid out, with beautiful pictures of some of the meals. I was lucky to have a culinary partner-in-crime, Chris, to help with all the complicated parts; however, any on their own would be good to make solo to bring to a potluck. Now, we have the difficult choice of which of these dishes to make for our next holiday get-together! The Baked Maple Sweet Potatoes sound so good! Though, honestly, everything is good.